Our portion sizes have increased dramatically over the past 50 years. 63% of Australians adults are overweight or obese and our increase in portion sizes has contributed to this. 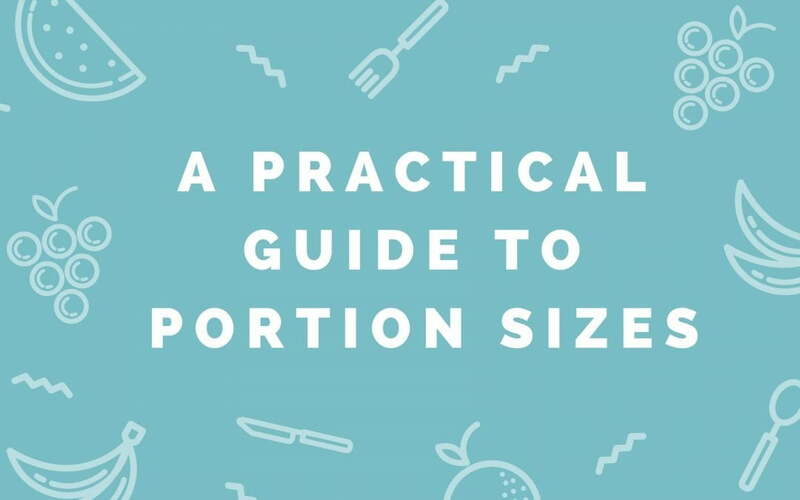 Understanding appropriate portion sizes is an important tool for healthy eating and can help you with your weight loss efforts and living a healthy life. For the purpose of this blog, I’ll be focusing on dinner portions, as this is what I am asked about the most. 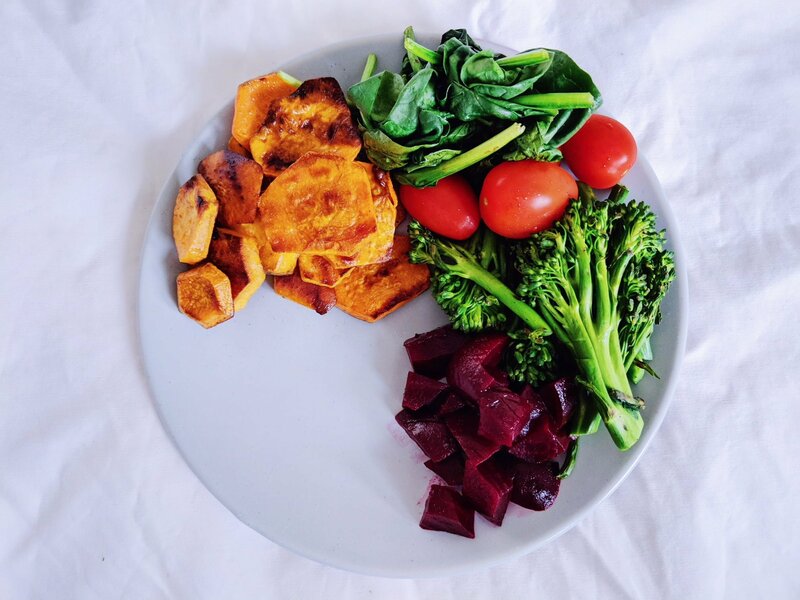 Research has shown we eat more food when we use larger plates. We mindlessly serve more food onto a larger plate. And the more food we are served, the more food we eat. Look at the picture below. 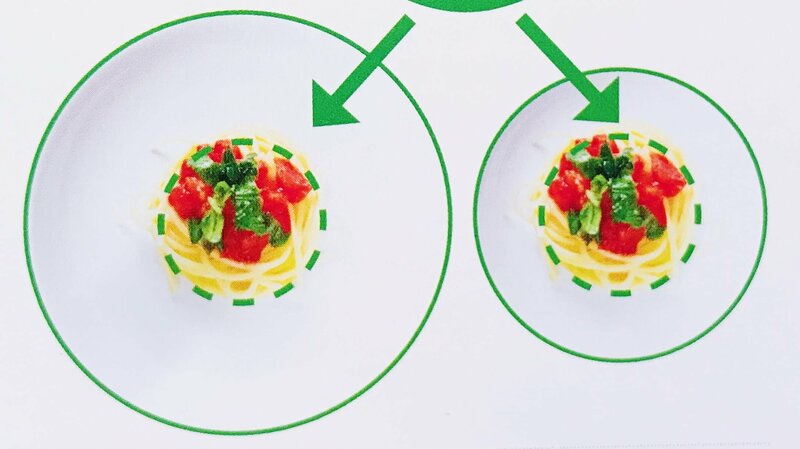 Both plates have the same amount of food on them, but the left plate, which is the bigger one, looks like it has less food. 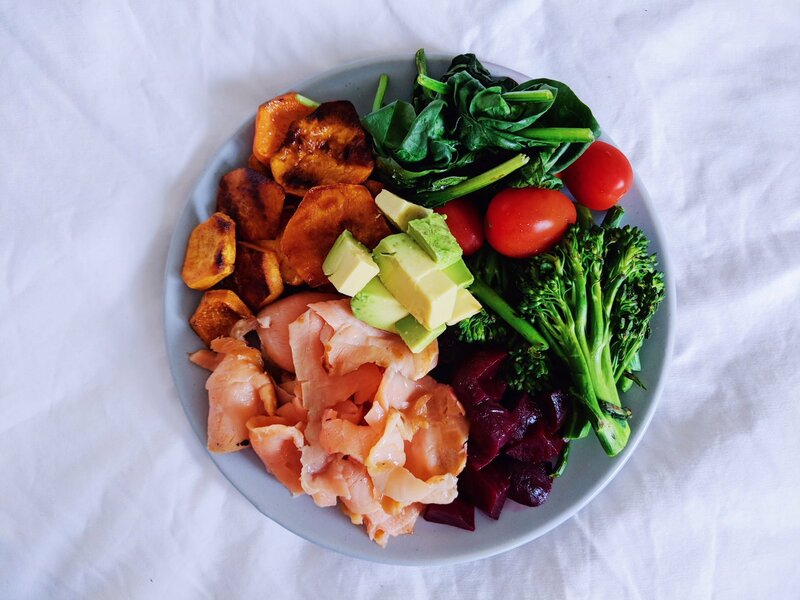 As a result, we would add more food to this plate when serving up, resulting in eating more. 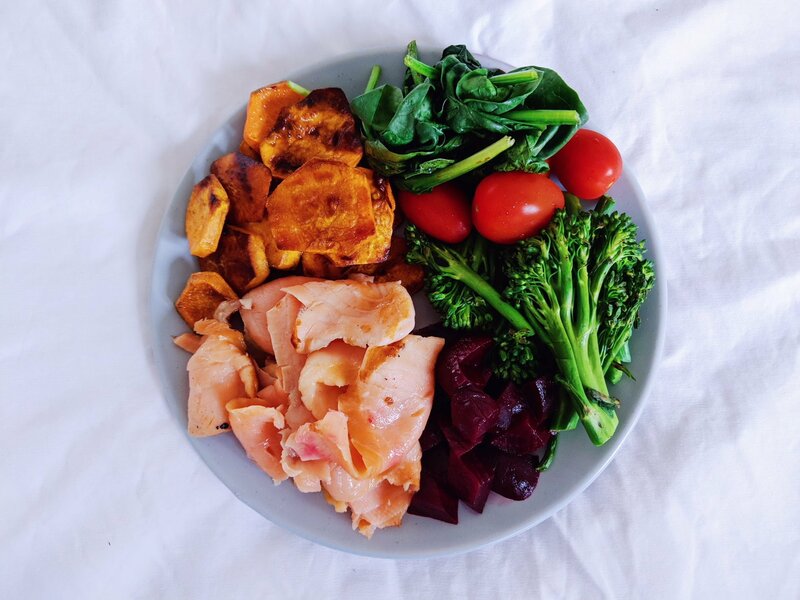 So consider the size of your plate and think about serving your food on a smaller plate. Note also that larger portions means bigger bites, faster eating and more kilojoules consumed. If you want to learn how the speed you eat effects your health, click here. Serve your veggies up first. Your “free” should fill half of your plate. “Free” veggies are all veggies excluding starchy veggies which are potato, sweet potato and corn. 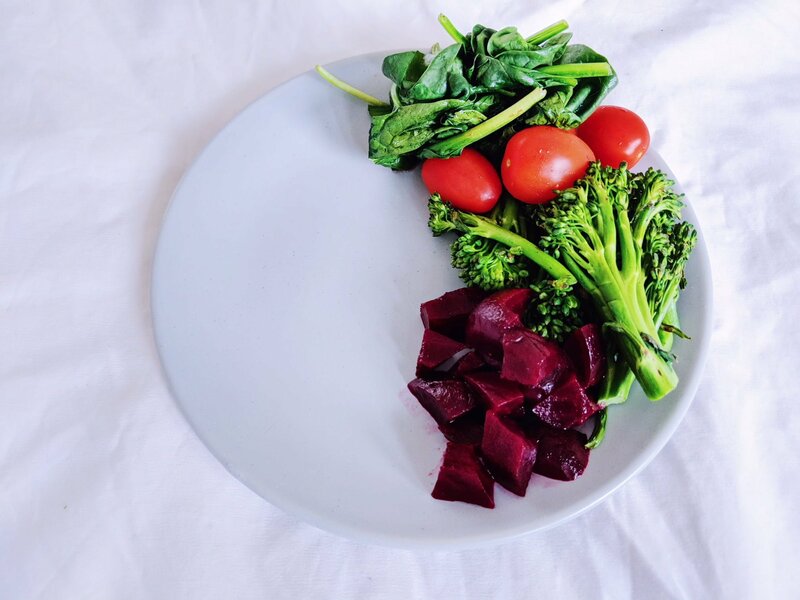 Aim for at least 3 different coloured vegetables. Carbohydrates can include sweet potato, potato, corn, lentils, beans, wholegrain rice, quinoa, wholegrain pasta, wholegrain bread etc. This is also equivalent to the size of your clenched fist. Note: if you often skip the carbs and choose to fill this portion with protein in an attempt to lose weight, there is no benefit. Both protein and carbs have the same calorie content per gram. Step 4: Fill the remaining 1/4 with a lean protein. Healthy protein options include fish (e.g. oily fish like salmon & tuna + white fish), lentils, beans, tofu + tempeh. This is also equivalent to the size of your palm. Healthy fats can include avocado, olive oil in a dressing (or used in the cooking process) or other healthy oils.